Dr. Schmitt is employed at Galen Medical Group and lives in Chattanooga, Tennessee. She is certified in Internal Medicine and Gastroenterology and serves on the ABIM Gastroenterology Board. I wanted to become a physician because I really enjoy lifelong learning. For my specialty, that means both cognitive and procedural learning. One of my fellowship professors advised me to stay humble and know when to ask for help. I felt the most proud when the inaugural group of women completed the American Society for Gastrointestinal Endoscopy (ASGE) Leadership Education and Development Program that we established for our national society. These women continue to inspire, educate, research and provide high-level care for patients with gastrointestinal disorders. They are considered the highest level of experts at what they do, and just as the name implies, they are the future leaders in our field. One of the biggest misconceptions about doctors is that we have a pill for everything and that all disorders have a “cure.” At least for now, some problems must be managed, not cured. I enjoy thinking about challenging issues that we must confront as a profession. One of these challenges is how we demonstrate quality to our peers and patients. Defining what this means is an important issue that we must address in a dynamic way as it will be a target that moves. How would you describe your experience of joining and serving on the ABIM Gastroenterology Board? I’ve learned how the questions on the specialty Certification and Maintenance of Certification examination are carefully constructed then scrutinized, criticized, edited, juried, analyzed, tested and reanalyzed in order for the questions to be fair and representative of the broad aspects of our specialty. After joining, I met many other individuals in both academic and private practice who aspire to set a standard for our specialty that is objective and attainable. What is the best and most challenging thing about serving? The conversation is the best thing about serving at ABIM. The current environment in healthcare can be overwhelming in terms of requirements for practice and regulation in the day-to-day care of patients. 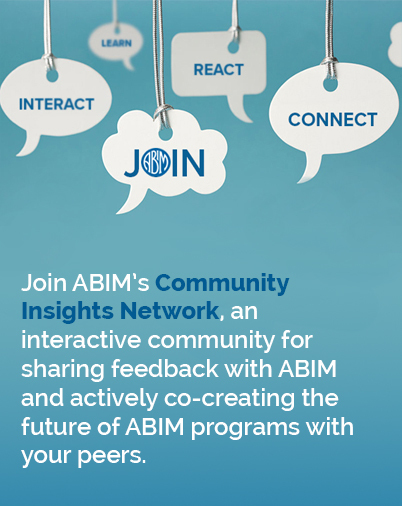 There have been many opinions expressed about the ABIM’s role in helping physicians demonstrate both internal and external credibility in what we do. This dialogue is critical in maintaining the integrity of what certification represents, while not increasing or duplicating demands on practice time. I enjoy Lindy Hop and swing dancing. Aside from medicine, my main interests revolve around my family, gardening, reading and travel.